Using Fall stamps to create a Christmas card! Today I'm sharing this beautiful Christmas card by Nina-Marie using our Falling into Autumn Stamp Set! I love how Nina-Marie shows us how to stretch our stamp sets by using our fall leaf set to create this lovely christmas card! By coloring the "berries" red and the branches green she made them look like festive holly! 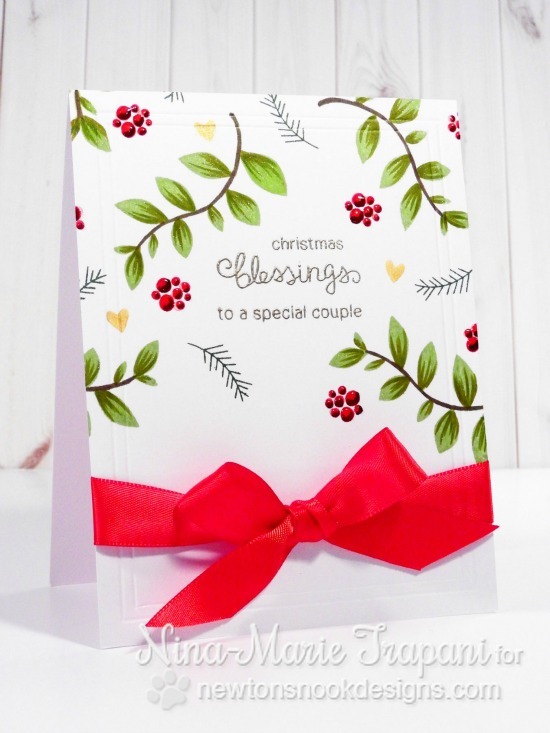 She also added in the little twig from the Fox Hollow Stamp Set and made a custom sentiment by mixing the words "christmas" and "to a special couple" from the Holiday Smooches stamp set and adding in the "blessings" from the Falling into Autumn stamp set! I love how with a little imagination you can take seasonal stamps and make them last all year! Love the way Nina combined the different sets to create a sweet holiday card! Beautifully simple - I love it! Absolutely adorable amazing card! Love no-line coloring! The coloring on this is SO lovely!!! Oh my goodness Nina, your card is just STUNNING! So beautiful!